In this second blog I'm writing for Modemuze (you can find the Dutch version here) I'll go into how to keep your vintage treasures in good shape and get maximum wear out of them. Of key importance is to be aware of their age and handle them conciously of that. Tips for caring for your clothes from a women's magazine, ca. 1940-45, mending thin spots before they become holes. Where museum pieces may never be worn vintage is something that can be used on a daily basis. Wearing vintage however requires a different mindset towards garments as when you are wearing modern pieces. This does not mean you can't do your everyday chores in a vintage dress, though there's always a chance of things getting damaged. Working with museum collections has made me more relaxed when wearing vintage through the knowledge that truly expetional pieces are being preserved in these institutions. It is a good thing to check how strong, water risistant or special clothing is and to keep this in mind when planning what to wear it for. A wild party in a fragile dress that can hardly be cleaned is not a good idea. Also when putting on a dress with a side closure some care must be taken as they tend to be less easy to put on. You have to more or less 'dive' into them whereby you should avoid any sharp accessoiries getting caught and keep lips with lipstick on it tightly pressed to avoid damage. Because we've gotten used to stretchy fabric it can all feel a bit tight-fitted, which is a thing you have to get used to. 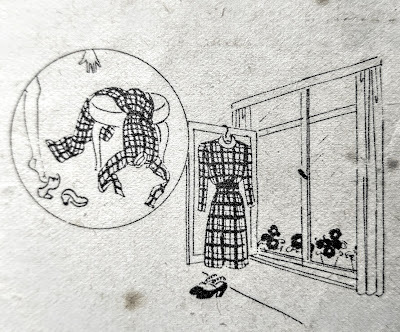 Illustrations from a booklet with washing instructions (ca. 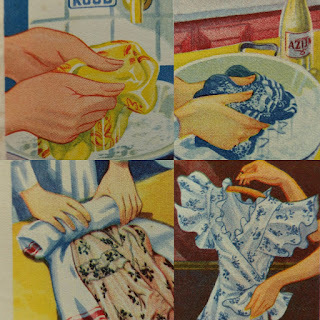 1937), washing carefully, rinsing with vinigar, rolling into a towel and drying on a hanger. Most old clothes are not made to be washed frequently as they used to harly wash them at all back in the day. The Dutch fashion jounalist Constance Wibaut advised women to wash their nylon underwear once a week, even if it was black, in 1958. And that's underwear, the layers that came on top were hung out and only washed if they were really dirty. You can wash a lot of vintage but just like grandma's old dishes can't be put in the dishwasher you'd be wise to wash your vintage by hand. Instructions from the period are often handy when figuring out how to do this. They unanimously advise to check if the color will bleed before washing first. This may be done by rubbing a wet piece of cloth over a piece of the fabric in a place where a stain would not be visible. If there's a lot of color on the cloth washing has to be done carefully and rather quickly. To reduce colors from bleeding vinigar or salt can be added to the water. Another important point is to use water that is not too hot and to take care the water for washing and rinsing is of the same temperature, to prevent shrinking. Rayon crêpe is prone to shrinking but can be pulled or ironed back into shape. Washing is always a gamble though. When in doublt or with dresses with a lot of embelishment it is better to go to a good dry-cleaner's. Be careful with early plastic zips and sequins though, they can melt when being dry-cleaned (sequins may also dissovle in water). Because clothes were not washed as often and deoderant was not at all generally used clothes smelling of sweat is a common problem. I smell the pits of clothes before I buy them but the smell can also only become noticeable through heat (from wearing or ironing). Washing or dry-cleaning does not remove old sweat most of the time. There are some cheap trics to tackle the problem like treatments with vinigar and/or baking soda. More extensive descriptions on how to do this can be found in two blogs I've written a while ago (see links at the end of this blog). A large tear in a vintage dress is mended with several shades of embroidery yarn. 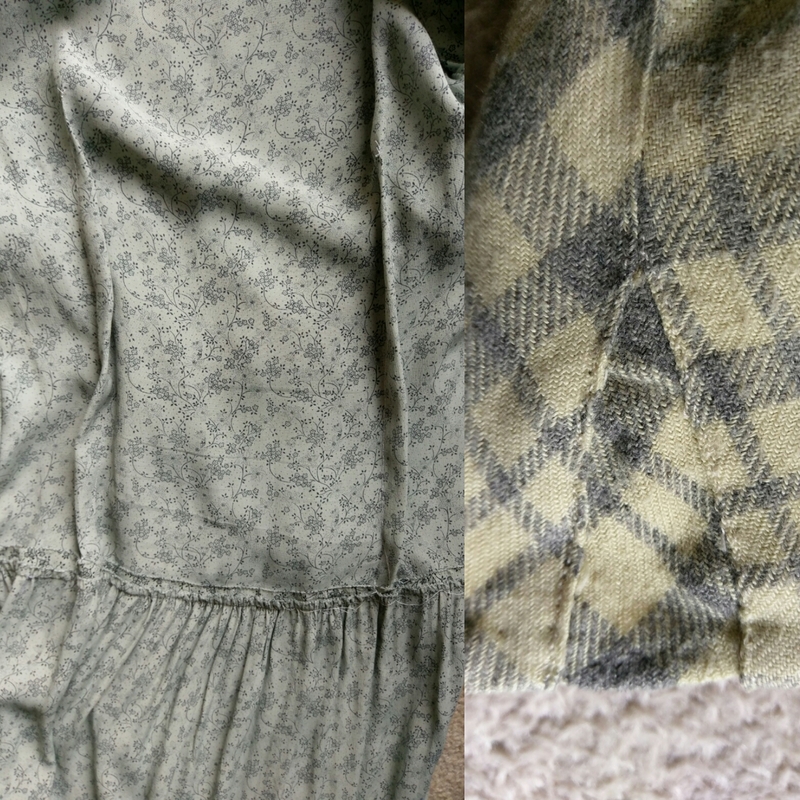 Back and front of the fabric. 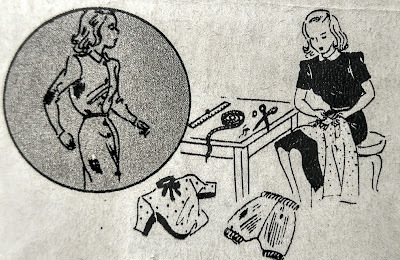 As vintage is often in need of repair it is handy to have basic sewing skills. Popped seams for example are very common but as the fabric isn't broken (only the threads are) it is solved by stitching it back togehter on the original seam. 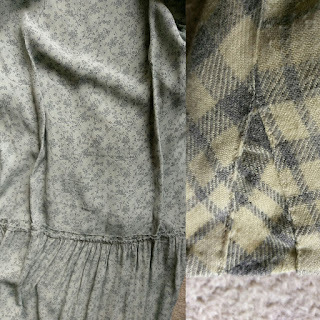 Darning is unkown to many of us but it can save many dresses with wear, holes or even tears. 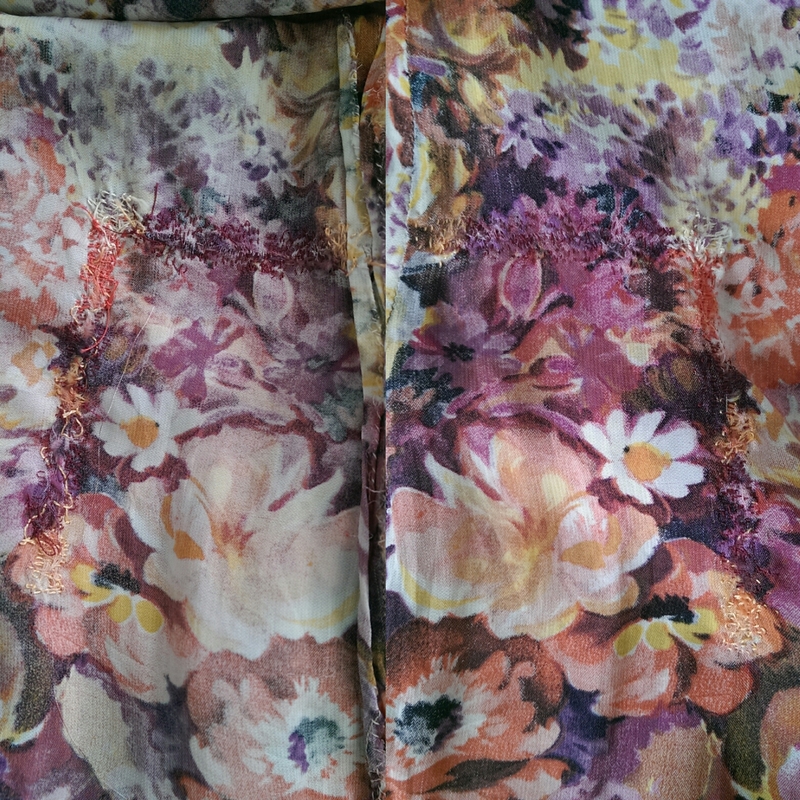 Especially when the fabric has a print many things an be mended almost invisibly. When the fabric is thin putting a piece of fabric underneath can also prevent the forming of actual holes. I'm very careful when altering a piece of over 60 years old and won't do anything that will drastically change the original design or cut away any fabric. In the back of my mind are all the lovely 30's dresses I've found that were cut short in the '70's. Because clothes were made to measure there's a good chance they will not fit exactly. This may not always be a problem but sometimes alterations are benificial. Taking things in is not that hard especially when there are darts already. Taking things out is more of an effort and can be visible, but because seams were more generous at least there is more fabric to work with. 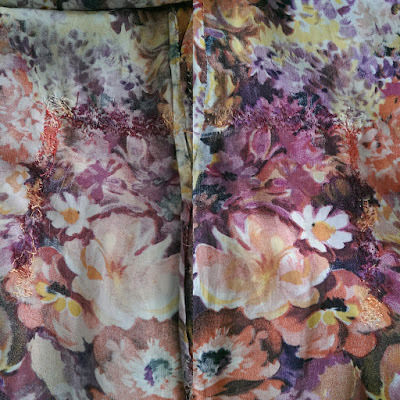 A dress has been taken in by adding darts at the back and a sleeve has been laid out by adding a gusset from extra fabric that has been cut away from a seam. To conclude this blog I'd like to stress that you should enjoy wearing vintage and not be affraid of things getting damaged. Something can always go wrong but they are only clothes after all, and with some common sense a lot can be prevented. In the next and last blog in these series I'll discuss my personal style, etiquette and styling rules from the 30-50's and how to compose an entire vintage look. Great article.We have a great collection of African fabrics. Colorful and best quality at lowest price. For whole sell price Visit us, hope you guys love them.